Finally the news that we have all been waiting for is out, its official BBM for Android & iOS is out. In few hours BBM for Android will show up on Google Play store and for iOS users on App Store & Samsung App store. Download BBM from either Android Play Store or iOS app store. When you reach front of line, you will be sent an email and you can start using BBM. For updates on how quickly the line is moving you can follow @BBM on Twitter. Groups – BBM groups help you share pictures, lists and appointments with group members. You can even be in a group with people who aren’t part of your own BBM contact list. Multi-person chats – Invite multiple contacts to have a chat together. 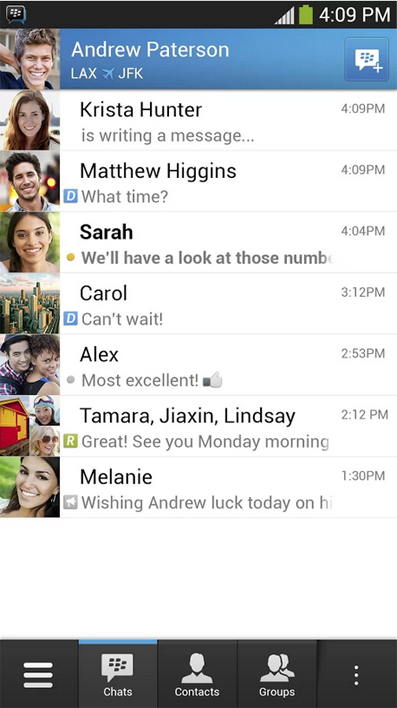 Broadcast messages – Send a message to multiple BBM contacts at one time. Post a profile picture using images, pictures or even animated pictures (GIFs). Update your status to let people know what you’re up to or how you feel.